Jim Dorn - Mechanical Power Inc.
As an independent sales representative in the 1960s and ’70s, Jim Dorn developed a passion for serving the needs of customers while establishing lasting relationships with his customers. 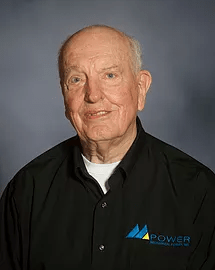 In 1976, he combined this strong drive for providing exceptional customer service with his mechanical engineering background to form what is now Mechanical Power, Inc.
“I have so enjoyed watching the individuals who have helped Mechanical power be what it is today. Seeing the organization continue to get better over time has been a treat to behold and I am most excited to watch as it continues to transform and do great things”. Jim still comes into the office everyday and looks forward to visiting customers in his famous bowtie. He puts family values back in the corner office and we at MPI are ever grateful for his presence and the opportunity to be a part of what he has built.